If you choose to become a middle grade mathematics teacher, you will have to take the National Evaluation Series Middle Grades Mathematics exam. Consisting of 150 questions, examinees have 5 hours to complete this rigorous exam. Beginning with the fundamentals of math, 17% of the test assesses understanding of number sense and operations. The longest section is composed of algebra concepts, processes, and functions. This makes up 33% of the exam. The next 25% deals with measurement and geometry, and the last 25% addresses statistics, probability, and discrete math. Mometrix Test Preparation has created a top notch method to give you the edge you need to be able to take on this exam. The NES Middle Grades Mathematics Study Guide was created by our team of researchers, and combines a review of the most essential topics with the teaching of instrumental test taking strategies. 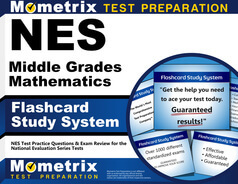 Use the NES Middle Grades Mathematics Study Guide in conjunction with our NES Middle Grades Mathematics Flashcards, which puts the ability to drill key vocabulary and concepts anywhere and anytime. Then you can use the free NES Middle Grades Mathematics Practice Test Questions to be sure you approach the test taking experience without worry. Mometrix Academy is a completely free resource provided by Mometrix Test Preparation. If you find benefit from our efforts here, check out our premium quality NES Middle Grades Mathematics study guide to take your studying to the next level. 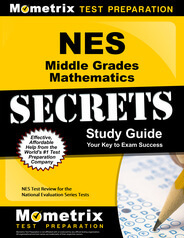 Just click the NES Middle Grades Mathematics study guide link below. Your purchase also helps us make even more great, free content for test-takers.